You guys. You just can't beat a free find. 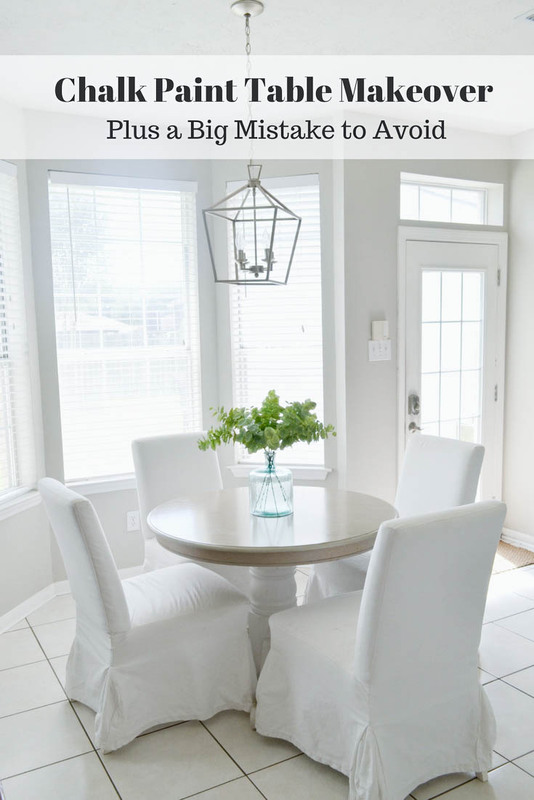 Today, I'm sharing all about how I scored this oak dining table (for free!) and used chalk paint and wood stain to make it over. I'm also sharing a big mistake to avoid when doing a furniture makeover. I literally dragged (drug?) this table home from an actual dumpster. I don't usually go looking in dumpsters for treasures, and, in fact, this is the only thing I've ever picked up out of the trash--that I can remember. But, one day many, many, years ago, I was home from school visiting my mom. At that time, she lived in an apartment complex on the west side of town. Sitting by the dumpster, one lucky afternoon, was this oak table. I couldn't believe my eyes! I went up and inspected it--and besides a little dust, there was nothing wrong with this table. Nothing! I couldn't get my hands on it fast enough. I bolted home, where I convinced my sister--who was probably only 10 years old at the time--to help me drag it home to mom's. And she totally indulged me. Thanks, Meg! We got it home and left it in my mom's breakfast nook. And there it sat. For months, if not years, in my mom's house. I always had plans to make it over (if you caught Phase 1 of my Mini Kitchen Makeover, you know how I have a hatred for orange-y oak), but the table eventually found its way to storage and just stayed there until my husband and I moved into our new home, about 2 years ago, Making over this table was the first project we tackled, and it's one you can totally do too, with a little elbow grease and my instructions, below. This post contains affiliate links for your shopping convenience. For my disclosure policy, see here. 1. Wipe the table clean. We used a damp rag. 2. Separate the table top from the table base. We just had to take nuts off 4 bolts under the table top. Then, we just lifted the table top off. 3. Sand the table base. So, this step is usually not required when using chalk paint--and you can totally skip it if you want. (Hey--who doesn't want to skip all that prep?!) But the type of finish you get when you skip prep definitely depends on the brand of chalk paint you use. I can easily tell a difference in projects where I've used Rustoleum's chalk paint when I've sanded first versus not sanding. So, because we used Rustoleum on this project, we sanded the table base thoroughly even though we were using chalk paint. Don't get me wrong, you can get away with not sanding--and lots of people do. But I wanted to guarantee a quality finish (that doesn't peel or scratch off), It made a world of difference, helped the paint adhere better, and just gave a smoother finish and better coverage. For the flat sides of each leg of the table base, we used the palm sander. We started with 120-grit sand paper and then moved to 220-grit. Be sure to start with the lowest number (higher abrasiveness) sand paper first! The medium grit sandpaper (120-grit) is great for removing old finishes and scratches. The fine grit (220-grit) is useful for giving the wood a light sanding before applying paint or stain. Then, we used sanding sponges for the curved parts and center pedestal. If you don't have a palm sander, you can definitely sand the whole thing by hand--it just takes a little more elbow grease. 4. Paint the table base. Using chalk paint, apply a coat of paint. I used Rustoleum's Chalked Ultra Matte Paint in Linen White. And, although many chalk paints (including this one) say you only need one coat, I almost always give at least two. Even after sanding, one coat of paint just didn't do the trick. We allowed the paint to dry completely (overnight) between coats. 5. Apply wax to the table base. I used Rustoleum's Chalked Protective Top Coat in Matte Clear, and applied it with a paint brush. This product also comes in a spray paint version, which would have been a lot easier! 6. Sand the table top. We used a portable work table and set the table top on top of it for ease. We used a palm sander all across the top of the table top because the surface was flat. The rounded edges of the table still had to be hand-sanded. We used a sanding sponge at 220 grit for that. Already looking so much better after a little sanding. 7. Wipe the table top with tack cloth. The tack cloth pulls off all the sanding dust. If you are staining the table stop, DO NOT SKIP THIS STEP! You want to get a clean surface before you stain the top! Here's a close up of what the tabletop looked like when we were applying the stain. For a more even coverage, I applied two coats of stain, wiping off in between coats. Then, we let it dry overnight. 9. Apply polyurethane to table top. Apply the poly sparingly! See the big mistake we made applying the poly, below. 10. Attach the table top back to the base and enjoy!! And yes, I was so excited to finally get this table complete, that I threw some flowers on it and snapped a pic before we even hauled it inside. After we applied the poly to the table top, it totally changed the color of the surface. So much so, that I didn't like it. At all. We just went a little overboard with the poly. Because we applied so much, it completely made the appearance of the wood stain a totally different color. So, be careful and use it sparingly! Because of our little goof up, we decided to start all over from scratch. We re-sanded EVERYTHING. Applied the wood stain AGAIN. Applied the poly AGAIN. A major pain, for sure, but live and learn, right? Because we essentially did this project twice, it took us forever. But you won't be poly-happy, and will only have to do it once, right? The after is a definite improvement! Not bad for a totally free table! I've got big plans for this breakfast nook coming soon and I can't wait to share them with you! UPDATE: I recently added new chairs to this space. Come take a look to see what this space looks like today, in this post HERE. What about you? Have you ever done a furniture makeover? Or committed a huge mistake while doing it? **Some affiliate links are included, which means I will receive a small commission at no additional costs to you. Thanks for keeping this blogging adventure of mine going! For my full disclosure policy, click HERE.